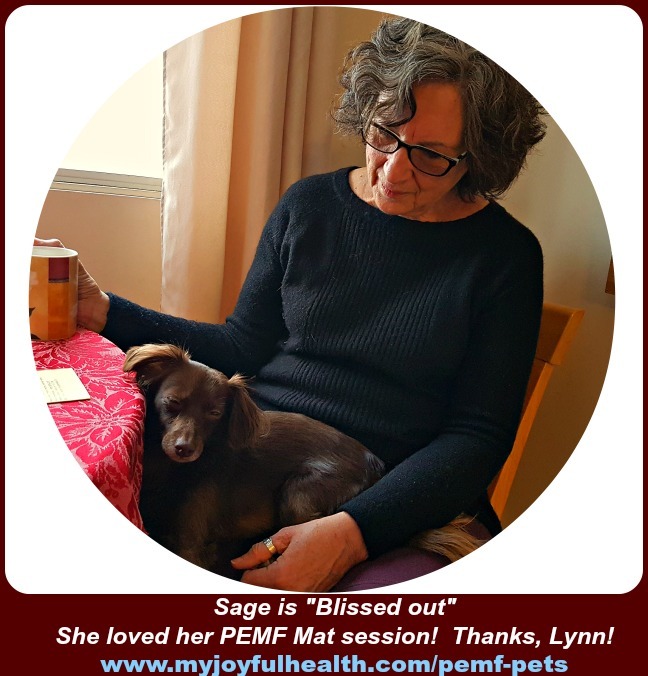 PEMF Pets – Dogs love PEMF – Isn’t this a beautiful photo of Lynn with her “blissed out” dog Sage? They were at my home last week. Lynn had 2 Relaxation sessions on my Swiss Bionic PEMF Omnium1 Mat. I set the PEMF Omnium1 Mat tablet at a Sensitive setting of only 10, for 10 minutes. Lynn enjoyed that while her wonderful dog Sage ran all over, discovering my place. She was very active and curious. Then Lynn and I visited for while. Then Lynn had a second session of 10 minutes on the Omnium1 Mat, on a setting of 10. This time, Sage jumped onto her lap, and stayed there during the full 10 minutes. Then – afterwards while we sipped tea at the dining room table, Sage was completely “Blissed Out”, as you can see from the photo! Lynn said to me that she has NEVER seen Sage so relaxed. The next morning, Lynn texted me to say that at 9:30 a.m. she had to go in and check on Sage, since she was still sleeping, and wake her up. Sage really needed that time for her cells to be “Recharged”, and her body told her to get more rest. The Pulsed ElectroMagnetic Frequencies are amazing for Relaxing and Recharging all of us humans, as well as pets!! Relax and Reverse ElectroSmog with the Omni Mat.